The stakes were high for Team USA on Tuesday at the 2011 World Championships in Baku, Azerbaijan as five U.S. boxers competed for a berth in the 2012 Olympic Games. A trio of American pugilists accomplished their goal with third round victories, and two-time Olympian and 2007 World Champion Rau’shee Warren (Cincinnati, Ohio) marked his place in the history books as the first U.S. boxer ever to qualify for three Olympic Games. Bantamweight Joseph Diaz, Jr. (S. El Monte, Calif.) and welterweight Errol Spence (Desoto, Texas) both enjoyed impressive wins on Tuesday as well to punch their tickets for London. Warren was clearly on a mission in his third round contest with Rey Saludar of the Philippines. The 24-year-old American started the bout on fire, peppering the unprepared Saludar with lightning quick combinations in the opening round. His efforts earned Warren a 7-2 lead after the first round. Saludar attempted to adjust to Warren’s tremendous hand speed in the second but had no answers as Warren moved out to 16-8 lead with one round remaining. He continued to add to his lead over the final three minutes to win a 22-12 final decision and clinch a berth in a historic third Olympic Games. 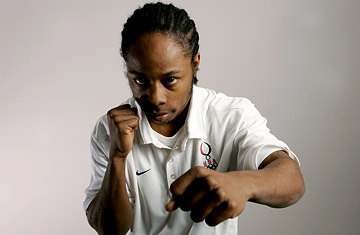 Warren was the youngest U.S. male athlete in any sport in the 2004 Olympic Games at only 17-years-old. He then entered the Beijing Olympics as the favorite in his weight class following a gold medal at the 2007 World Championships, which served as the first international qualifier for the 2008 Olympics. Yet, he was unable to fulfill his dream of putting a gold medal around his mother, Paulette’s neck in both Athens and Beijing, so he made the rare decision to come back for a third attempt at his lifelong goal. Warren will continue his run toward a second world title in a quarterfinal contest with England’s Khalid Saeed Yafai on Wednesday evening. Diaz competed in one of the best bouts of the day in his third round match-up with 2008 Olympian and 2009 World Championships bronze medalist Oscar Valdez of Mexico. The two boxers were throwing punches in bunches from bell-to-bell as they battled it out for a berth in the 2012 Olympic Games. Diaz got the better of the exchanges and held a 6-4 lead after the first round. The high pace continued in the second, but Valdez couldn’t dent Diaz’s advantage and the American took a 15-13 lead into the final round of action. Despite Valdez’s best efforts, Diaz held on to a one-point lead over the last three minutes to win a 22-21 final decision and clinch his Olympic berth. He will compete for a spot in the semifinal round on Wednesday in a bout with Cuban Lazaro Alvarez Estrada. Spence won the final U.S. Olympic spot of the day in his welterweight showdown with the number one seed in the tournament, Hungary’s Imre Backsai. Once again, the American boxer took the key early lead in the bout. He claimed a 7-3 advantage after the first round of boxing in their welterweight contest. Backsai picked up the pace in the second but Spence matched his efforts as both boxers put 10 points on the board. Spence took a 17-13 lead into the last round but he didn’t rest on his advantage. The Dallas boxer kept his foot on the gas, pushing his lead to a 10-point margin to win a 26-16 final decision and an Olympic berth. Spence will compete in quarterfinal competition on Wednesday in a contest with two-time light welterweight World Champion Serik Sapiyev of Kazakhstan. Light heavyweight Marcus Browne (Staten Island, N.Y.) was the first American boxer to compete in Tuesday’s third round action as he faced 2009 Heavyweight World Champion Egor Mekhontsev of Russia in the morning session. Browne stayed close through the first round, facing a slim 4-2 deficit after the opening stanza. Yet Mekhontsev began to pull away in the second, and following a warning for holding, Browne faced a 10-4 deficit as the final round began. Mekhonstev went on to win a 14-6 final decision over Browne to end his World Championships run. Middleweight Jesse Hart (Philadelphia, Pa.) was the next U.S. athlete to take the ring in Baku, and he battled Kazakhstan’s Danabek Suzhanov in middleweight action. Hart grabbed a 5-3 advantage after a relatively slow paced first round of action. Yet the referee began to get highly involved in the second, taking his first of two points from Hart. The bout moved into the final round with the two boxers deadlocked at 9-9. After the referee took a second point from Hart in the third round, he looked to make up the points he lost with a strong two-punch combination. Yet when the final bell rang, it was Suzahanov winning the 17-15 decision to eliminate Hart from the 2011 World Championships. Lenroy “Cam” Thompson (Lenexa, Kansas) closed the day for his U.S. team in a close bout with two-time Olympian Viktar Zuyev of Belarus. Like Hart, it was Thompson taking the first lead in his bout with the experienced Belarusian boxer. Thompson held a 6-4 edge after one round, but after the referee penalized Thompson in the second, Zuyev took a 13-11 advantage into the final round. Zuyev went on to win an 18-15 final decision over Thompson. The three remaining U.S. competitors will all return to the ring on Wednesday in quarterfinal action in Baku. USA Boxing National Coach Joe Zanders (Long Beach, Calif.), coaches Ronald Simms (Stafford, Va.) and Manny Robles (Los Angeles, Calif.), technical advisor Ken Porter (Akron, Ohio), and Team Manager Ken Buffington (Marshalltown, Iowa) are leading the United States team in Baku. The 2011 World Championships are the first international qualifying tournament for the 2012 Olympic Games, and the light flyweight through light heavyweight boxers must place in top ten to qualify for London while the heavyweight and super heavyweight competitors need to place in the top six. For the full brackets for all 10 weight classes and the most up-to-date results, go to http://www.aiba.org/en-US/2011/2011WorldBoxingChampionships.aspx. For more information on Team USA, go to www.usaboxing.org. USA Boxing will tweet all the American results as they happen @usaboxing.